Penetrative damp is a common type of dampness seen in buildings of all types. We treat penetrative damp mainly by applying a colourless, breathable water-repellent on to the walls. Defects in roofing such as damaged flashing, broken or mislaid tiles or slates. Imperfections in the brickwork, stonework or masonry such as absence of pointing or cracks. Higher porosity of bricks or stones used for construction. Faulty mastic work around doors and windows. Damaged cavity wall trays or their absence. 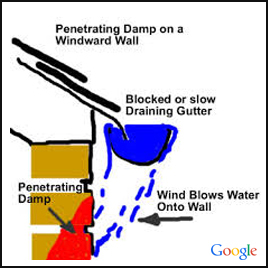 Rain penetration through walls is mainly seen in buildings with single skin walls. But it may also occur in buildings with cavity walls. The major reason for rain penetration through the walls is defects in masonry such as porous bricks, stones, or mortar. Defects such as incorrect pointing, cracks or unfilled joints. Defects in rendering is also a cause for penetrative damp. Call our experienced team for the most suited penetrating damp solution for you.